畢以迪（James BEATTIE），是紐西蘭懷卡多大學歷史研究所所長，他在該校教帝國史、環境史、庭園史、世界史。他已發表五十篇以上的論文。除本書之外，他已和其他學者共同主編六種論文集，包括最近與 Emily O’Gorman 和 Edward Melillo 主編的 Eco-cultural Networks and the British Empire: New Views on Environmental History (Bloomsbury, 2015)，與 Richard Bullen 主編的 Visions of Peace:The H.W. 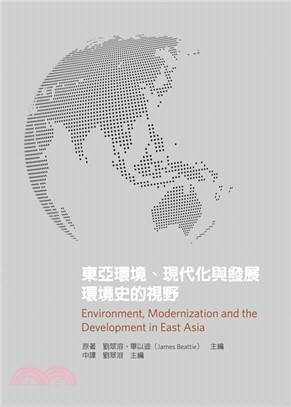 Youren Collection and the Art of Chinese Cultural Diplomacy (2014)。他也是一份期刊 Oecology: International Review of Environmental History 的總主編，也是一項關於路易‧艾黎（Rewi Alley）研究的共同主持人，經費達四十三萬四千元。他目前的研究是為撰寫三本書：Rewi Alley, Art and Chinese Cultural Diplomacy (with Bullen);People and Environment since the Holocene (with Bruce Clarkson); and Chinese Migrant Landscapes: Environmental Exchange between South China and New Zealand. 劉翠溶（Ts’ui-jung LIU），目前是台灣史研究所兼任研究員。她於1974年獲得哈佛大學東亞區域研究博士學位。她在中央研究院曾任職於歷史語言研究所、美國文化研究所（歐美研究所的前身）、經濟研究所、台灣史研究所。她已出版三本專書和七十多篇期刊論文，涉及經濟史、人口史、環境史等領域。她1996年當選中央研究院院士。她於2014年退休。她最近主編的論文集有：Environmental History in East Asia: Interdisciplinary perspectives(Routledge, 2014)，Local Realities and Environmental Changes in the History of East Asia (Routledge, 2016), 及 Environment, Modernization and Development in East Asia: Perspectives from Economic History (co-editor: James Beattie, Palgrave McMillan, 2016).